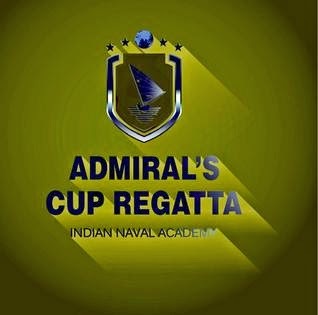 1 The fifth edition of ‘Admirals Cup’ Sailing Regatta concluded on 13 Decemberat the Indian Naval Academy (INA), Ezhimala. Indian Navy (Team INA), with their consistent performance won the Admiral`sCup. Bahrain and United Kingdom teams camesecond and third respectively. CadetEbrahim Bin Sameer Al Shuwaitar of SaudiArabia stood first in the individual position of open category followed by Cadet Ahmed Abdullah of Bahrain and Lieutenant Anke Dahlmann of Germany at second and third position respectively.Lieutenant Anke Dahlmannalso stood first in the individual positionfor women’s category. Vice Admiral AjitKumar P, Commandant, INA was the chief guest for the closing ceremony. 2 The Regatta put to test notonly the mettle, grit and skills of the participants, but also their physicalfitness, endurance and mental robustness against the elements of the naturei.e. Water and Wind. The picturesque EttikulamBay, at Ezhimala witnessed a total ofnine races, run from 11 to 13 December. A total of 36 participants includingthree lady participants from Australia and Germany displayed their utmost zeal,hard work and determination to give their best in the keenly contested racesover the past three days. The event has become very popular since its inceptionin 2010. Teams from various parts of the world participated. In all,participants from sixteen different navies including Australia,Bangladesh, Bahrain, China, Egypt, France, Fiji, Germany, Mauritius, Oman,Saudi Arabia, South Africa, Sri Lanka, UAE, USA, United Kingdom, apart from India. A total of 18 teamsparticipated, with each team fielding two boats. As hosts, the Indian Navy fieldedtwo teams, one each from INA and NationalDefence Academy, Khadakwasla. 3 ViceAdmiral Ajit Kumar P presented the “Admiral’sCup” and individual prizes to the winners. Speaking at the closing ceremony, he emphasized the importance of continuing to build bridges of friendship through events such as the Regatta. He added that Indian Naval Academy looks forward to participation by a larger number of maritime nations and Naval Academies in the coming years, especially enhanced participation by women trainees. Students from local schools like Kendriya Vidyalaya and NCC cadets were also witnessed the event.